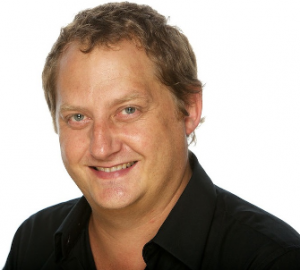 Professor Brett Neilan, molecular biologist and microbial chemist, brings his considerable skillset to the University of Newcastle. The identification and genetic manipulation of unexplored microorganisms could revolutionise everything from polymer production to pharmacology to sun protection. From the deep-sea, to hot springs, to the human gut, a massive and diverse range of diminutive life forms on this planet has been left largely unprobed. And that is where Brett Neilan steps into the picture. New technology in the field of genomics has allowed scientists to begin molecular bio prospecting – looking for undiscovered microorganisms, fungi and bacteria, for utilisation in industry and medicine. Australia is at the forefront of the research into the genetics of toxic bacteria and algae, with Brett part of the group that first identified the genes that make these toxins. As the new Head of School, Environmental and Life Sciences, Brett aims to continue with his research, whilst facilitating the fusion of the diversity of skill sets within the school. Brett began his research career looking into genetic diseases, like muscular dystrophy, and how they are passed from parents to children. From there, he moved into the environmental microbiology space, investigating the genetic makeup of toxins produced by cyanobacteria, or blue-green algae. Not only are cyanobacteria toxins fatal in large doses, but in China particularly, long-term accumulation has been linked to increases in liver cancer. Identifying the genes in these toxins means a clear process for testing water purity. If the genes are present in the water, the toxins are present too. This obvious application could have major impact on the health of millions across the globe. Other applications are becoming apparent. But why would we need more toxins? Microbes produce toxins as a defense system. Traditionally we have viewed them as a danger to the human body. Noting that any compound is fatal at the wrong dose, Brett is using his knowledge to change long held perspectives on naturally occurring toxins. “An antibiotic or immunosuppressant are both toxins, but we don’t see them that way because they actually help us,” Brett says. Saxitoxin, found in shellfish, is known to cause fatal paralysis. “But at the correct dose, saxitoxin is a very effective painkiller,” Brett claims. As it turns out, the genes that make toxins in cyanobacteria are extremely similar to the genes that make penicillin, or cyclosporine. “These toxins can also be used to study how cells in our body change and divide through the life cycle,” Brett points out. Another application of microorganism toxins Brett is currently working on is their potential use as alternative food preservatives. One of the stumbling blocks to harvesting naturally occurring ingredients for use in medicine is the inevitably finite supply. Brett reveals that it is more often a symbiotic organism attached to a plant or animal that has healing properties, rather than the plant or animal itself. Therefore, over-harvesting not only threatens the environment in which the microbial life thrives, but is inefficient. Another enemy of natural harvesting is time. Host organisms may take years to develop to the point where they are able to support the target microbes. 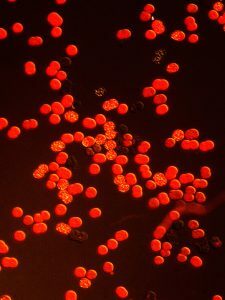 Using molecular biology, however, Brett can transfer the genes of the targeted symbiont into a fast growing mass production medium such as yeast or ecoli. This technique makes the drug simpler to farm and harvest, and fast growing, without affecting the population of the microbes or their hosts, or creating chemical waste. “You can produce biofuel and biomass, but you can also produce this value added substance, which could typically be an antibiotic or some type of drug,” Brett says. “It could also be a precursor to a bio plastic, or polymer,” Brett says. To extend his work from the research to production, Brett relocated to Newcastle to take advantage of the region’s expertise in boutique brewing, and high end manufacturing ethos. He has a knack of knowing where to be at the right time. Microcystis aeruginosa, seen here with its photosynthetic pigments all aglow under UV microscopy, produces microcystin, the world’s most common freshwater toxin. After receiving a PhD from the University of New South Wales, Brett has held postdoctoral positions at Stanford (NASA Fellow) and Humboldt University Berlin (Alexander von Humboldt Fellow). His first postdoctoral research program, with Professors Don Lowe and David Relman was the first investigation of microbial life associated with stromatolites using modern molecular biological and phylogenetic techniques. Stromatolites are biologically formed geological structures grown by bacteria that have existed in hyper saline waters in subtropical regions, such as Shark Bay in Western Australia, for more than three billion years. It is in these extreme environments that Brett believes the microbial life that will provide us with new medicines and applications for industry will be found. “We are targeting what we are calling extreme environments, or understudied environments,” Brett says.